Looking for a unique touch or a small run? Applique with Artech could be the solution to putting your business image out front. Appliqué and transfer processes can produce diverse results. Using a heat seal press it’s an effective method for a fast turn around and is inexpensive. On the other hand if you are looking for superior quality garments to set you apart from others, then embroidery flocking will put your branding in another class. 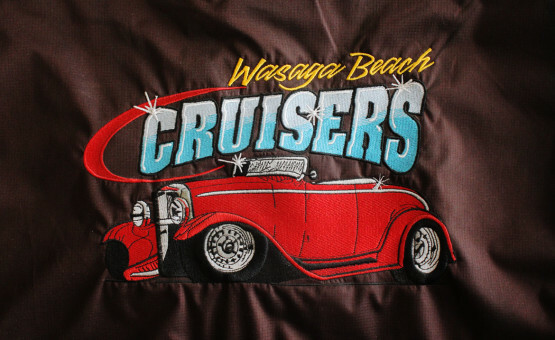 Appliqué methods in the promotional and uniform branding industry is a popular choice for large logos and graphics to be applied to garments and material products. It is also great for printing industrial workwear and sportswear, or for specialty one off t-shirt designs. Appliqué refers to the technique of attaching smaller pieces of fabric or vinyl (transfer) cut-out designs to larger items with contrasting colour or texture. In the promotional industry it can be embroidered or heat-sealed (sometimes both) on to almost any fabric product. Artwork is cut using computer aided design technology following vector paths. Design is almost only limited to your ideas, and the cutting process is controlled by computer to ensure that the print looks exactly as it does on screen. The combination of embroidery and appliqué help to create something distinct and special in apparel so that logo wear is attractive, stylish, and affordable. Excellent for one-offs to eliminate silk screen set-up costs you can have single colour designs cut from a selection of colours and transferred directly to a huge range of products from bags to jackets. Flock Prints use velvety material to add a whole new dimension to your promotional wear adding a 3d textured feel. This process can put full colour prints directly on your chosen Product. We print to a film material, cut it out using CAD software and heat-seal the design to the fabric. Great for small runs, multiple colours and large images. If you are an industrial worker in a trade or have staff that require High Visibility reflective bands on their workgear then think about branding your workman’s clothes with your logo. Keep it simple or make your company name the reflective element, a unique touch to safety.